Hi, I am interested in your 1973 Ford Bronco (stock #WWVA580.KT) listed on Autotrader for $30,900. I'd like to get more information about this vehicle and confirm its availability. Worldwide Vintage Autos is pleased to present this beautiful and restored 1973 Ford Bronco 4X4. This rare bronco comes complete with a removable soft top and powerful V8 engine. The original Bronco was an ORV (Off-Road Vehicle), intended to compete primarily with Jeep CJ models and the International Harvester Scout. The Broncos small size riding on a 92-inch (2,337 mm) wheelbase made it maneuverable for some uses, but impractical as a tow vehicle. 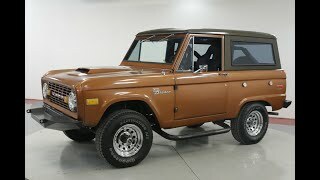 The Bronco was Fords first compact SUV. -Gold Metallic Paint with Dark Silver Top. -Powder Coated Front and Rear Bumpers. -Firestone 30 inch Radial Tires. -302 V8! Factory Carb and Air Cleaner.